A two pack polyurethane high build acrylic finish and coating, for long lasting protection of exterior elevations on buildings and structures. Tough, hard-wearing flexible film, with excellent colour retention and weathering resistance. Good flexibility and excellent water resistance. Apply directly to suitably prepared powder and oil coatings. Direct application to most external cladding including Plastisol and PVF2, properly prepared, clean, free of contamination, dust & dry. Direct to powder coatings, clean, lightly abraded, dry & free of contamination. 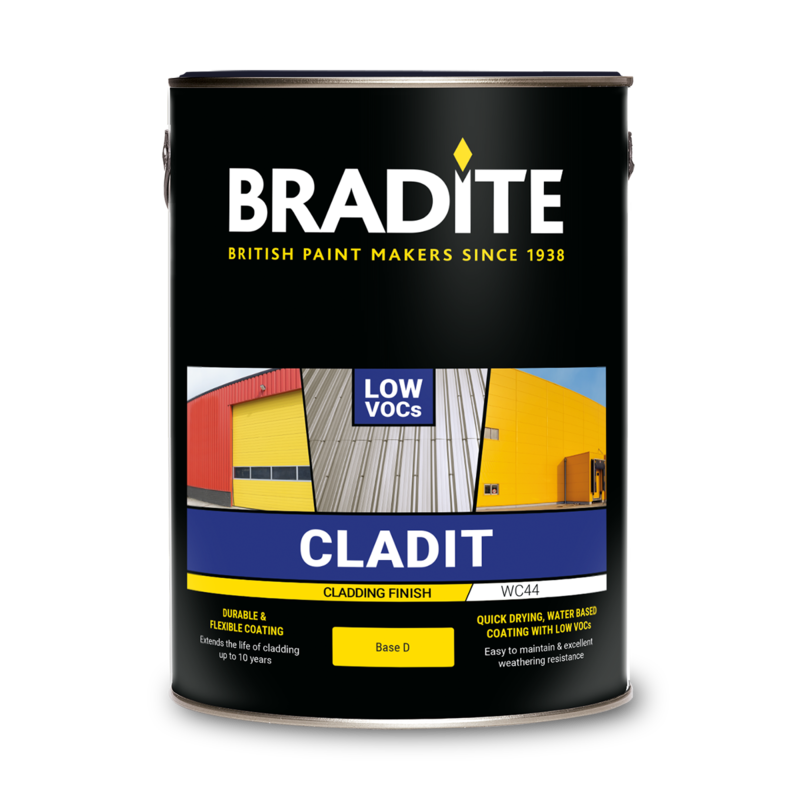 Correct preparation is vital to ensure you obtain the full benefit from Bradite Cladit Coatings. Thoroughly degrease using Bradite TD39 diluted with up to 9 parts water, rinse with clean water and allow to dry. This procedure should be carried out in conjunction with jet washing equipment at a pressure of no less than 1500psi and in such a way as not only to clean the surface but also to remove any loose and flaking material. Ensure that the existing cladding coating itself is well adhered to the substrate (carry out a series of adhesion tests if necessary). Scrape failed areas to a firm edge, making sure all edges are feathered. 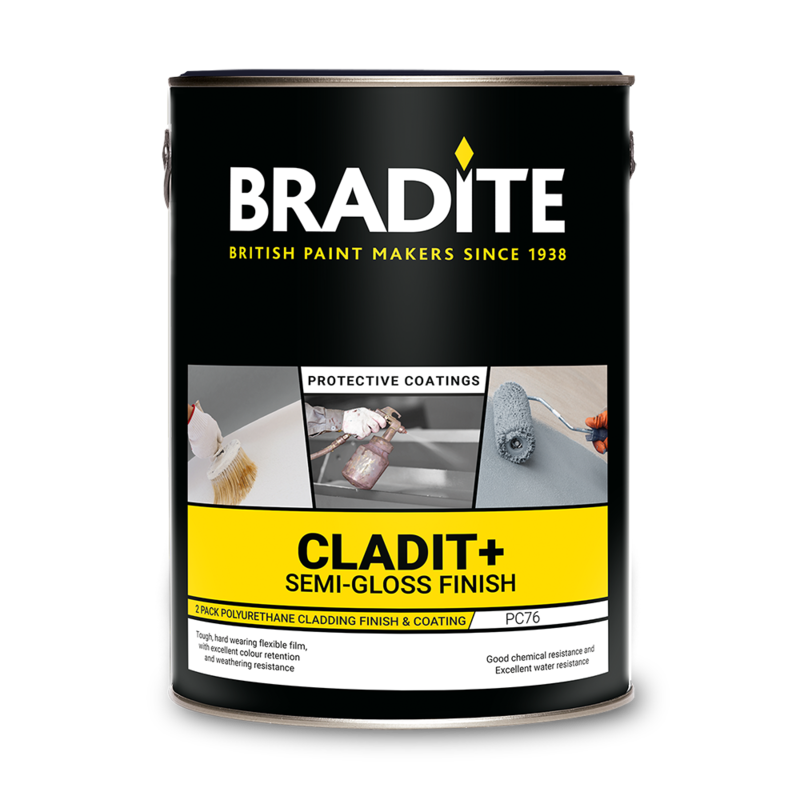 Spot prime any areas of exposed non-ferrous metal using two coats of correct Bradite primer. In extreme cases the non-ferrous coating itself may have broken down exposing the underlying steel substrate. Any such areas should be manually or mechanically prepared to clean bright metal (SIS St3) and spot primed using correct Bradite primer. Do not paint in adverse conditions. Temperature should be a minimum of 3°C above the dew point during application and cure. Rain on the surface shortly after application can affect the final appearance. Avoid painting in areas exposed to direct sunlight as this may accelerate drying and make application difficult.